For details of our most recent production, please click here. For details of previous productions, please click here. Relays is Ballinasloe's premier and oldest Amateur Drama Group. Our Secretary can be contacted by email here. The picture on the left shows Sarah Dooley and Eileen Quinn. Eileen is Relays longest serving member having first performed with the group in 1960. 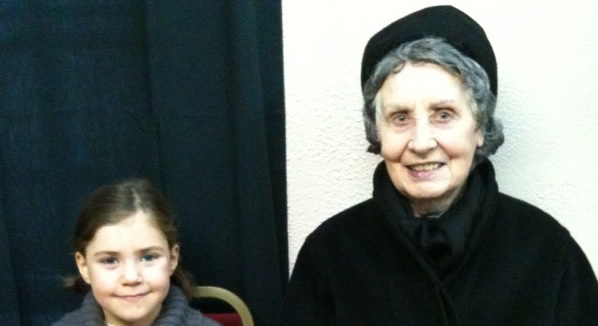 Sarah is its newest member having first performed, with Eileen, in the last production of The Field. Every email address on this page has an "x" as the starting letter. To use any of the addresses you will need to remove the "x" that precedes the address. When you click on the link and your email client opens just edit the address by removing that leading "x". We are sorry for the inconvenience but the "x" is prevent to prevent Spam being passed on to the recipient. If you are a present or former member and would like to get a relays.ie email address then please click here. The Relays' telephone number is 087 1224744. If you are interested in joining or working with the group onstage then please click here. If you are interested in joining or working with the group offstage then please click here. If you are interested in sponsoring our group or advertising on our poster, programmes or website or in becoming a patron then please click here. If you want to join our mailing list to get regular Relays' news then please send an empty email to this address. You will be asked to confirm.